Yet even if you accept that Tetragrammaton is a slight step down, it’s still remarkably original and easily stands out in the death metal world for the way the band throws together music and blood-drenched lyrical themes rarely touched upon. Human Wave Attack, for example, is like Ministry meets Nile, locking into a groove and throwing pulsing electronics and Arabic wails over the top, lyrics dealing with Islamism and Iranian history. The following Drugs, Thugs & Machetes opens with scraping knives and tribal percussion, moving from Sepultura to Incantation in sound as the lyrics deals with the Rwandan genocide, returning again and again to whistles and shouts of ‘black power, Hutu power’ – even throwing a bit of Martin Luther King in there for full ironic impact. It’s when you lock into the band’s historical mindset that the samples really make sense, although some of what initially appears to be stumbles by the band turns out to be moments lost in translation, though. Todesnacht von Stammheim, for example, is something like Rammstein playing death metal, all Teutonic slam and groove, with chants of ‘Ho Chi Min’ and lots of widdly soloing towards the end. It didn’t make much sense at first, although reading an interview with the band subsequently told me it’s about the Baader-Meinhof gang. You can’t so easily explain the sheer tongue-in-cheek self-aggrandisement of SADM (Svpreme Avantgarde Death Metal) expect through a sense of humour that doesn’t quite come across – the speedy battery that follows the ridiculous spoken section at the start needs no translators, however. And a line about the band being ‘a pastiche of left-wing cant’ and several songs focused on the bloodthirstiness of Islamism puts the band over on the right of the political line, something that seems rare these days. Not that you have to agree with the band to find the likes of Qasr Al-Nihaya exciting, starting slow and chuggy and building into a galloping headbanger the likes of which we were hearing from Ministry during the George W years. And ten-minute finale Aslimu!!! - All Slain Those Who Bring Down Our Highly Respected Symbols to the Lower Status of the Barren Earth focuses more on the atmospheric side of the music, lengthy chanting and grandiose symphonic backing bringing the album to a close. in the aforementioned SADM. 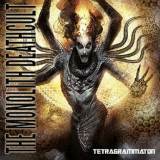 Whatever point the band are pushing underneath the cheerful self-debasement, it’s one that is carried along well by the music, and serves to make The Monolith Deathcult one of the most original entities in the death metal scene, and Tetragrammaton an album that fans of the leftfield would do well to check out.